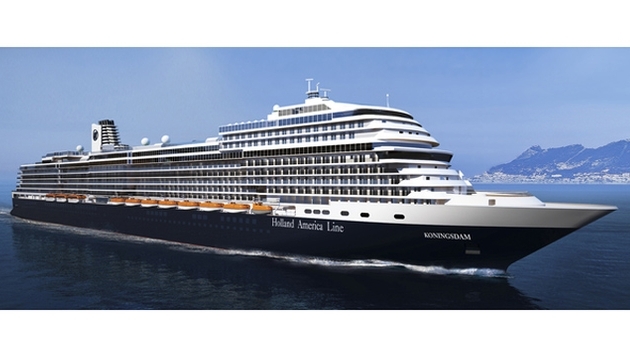 When the 2,650-guest ms Koningsdam sets sail in February 2016, it will launch the beginning of a new era for Holland America (HAL). Not only is it the cruise line’s first Pinnacle Class ship, but it also represents a few other firsts insofar as design and several enhancements to the already stellar onboard experience fans of Holland America have come to expect. 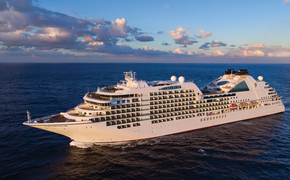 From a design perspective anyway, the ship is heading in a new direction with interiors created by Adam D. Tihany and Bjørn Storbraaten, who have married the line’s signature classical feel with a more hip and contemporary style. Tihany, recognized as one of the world’s foremost hospitality designers, took his inspiration from the “architecture of music,” focusing on graceful curves throughout the ship’s public areas. The ship’s central atrium, for example, soars three decks to a ceiling “skylight” that will serve as the backdrop to varying artistic images, from cirrus clouds floating across a deep blue sky to dramatic plays of color or a starry night sky. The centerpiece of the atrium is a stainless-steel sculpture representing a string quartet. Storbraaten, a renowned architect and designer in his own right, expands upon Tihany’s vision in a dramatic departure for HAL. Typically a single level, the Magrodome has been expanded to feature two glass-enclosed levels, a dramatic departure for the cruise line. It’s hard to know what will dazzle guests more — signature dishes created by influential chefs from around the globe or the modern, elegant design of the main Dining Room. Strong architectural pillars soar to the ceiling, while a curved copper sheath surrounds the two-story wine cellar. Modern light fixtures and furniture are being custom-made for the ship, as well. Tihany’s musical inspiration continues in the newly imagined, two-story Queen’s Lounge, which plays host to the B.B. King Blues Club and an eight-piece band. By day, this iconic spot will play host to guest lecturers and presentations. By night, the Lounge transforms itself into an elegant entertainment venue with a theater and the largest dance floor on the ship. And come the wee hours, the Lounge is reinvented once again into a late-night dance club complete with a state-of-the-art sound system and LED lighting effects. Regardless of whether guests are traveling in style or family style, they won’t have to compromise thanks to the Koningsdam’s graciously appointed suites. Guests staying in the Neptune Suite, for example, will enjoy such special amenities as a full whirlpool-size bath, private veranda and floor-to-ceiling windows, in addition to exclusive use of the Neptune Lounge, available only to guests cruising in a Neptune or Pinnacle Suite. Family Ocean View suites provide two bathrooms — one with a shower and sink, the other with a bathtub, shower, sink and toilet — and space for up to five guests, ensuring that traveling as a family doesn’t mean leaving comfort and style behind.